Americans ate a record amount of meat last year—[222.2 pounds of meat and poultry per person, on average]( https://www.forbes.com/sites/michelinemaynard/2018/01/02/veggies-may-be-healthier-but-in-2018-americans-will-eat-a-record-amount-of-meat/#4630117e19b9). 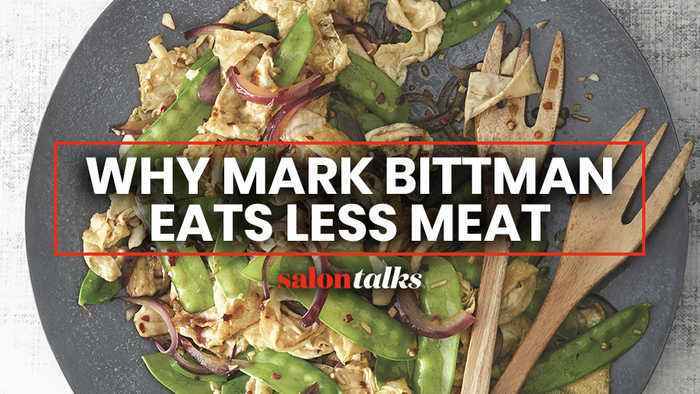 At the same time, if you’re looking for some motivation to cut back on your meat intake for environmental or health reasons, cookbook author Mark Bittman has some ideas. Bittman, the author of the beloved 1998 cookbook [[“How To Cook Everything”]( http://www.amazon.com/dp/dp/0764578650/?tag=saloncom08-20), shared his latest effort, [“Dinner for Everyone: 100 Iconic Dishes Made 3 Ways Easy, Vegan, or Perfect for Company”]( http://www.amazon.com/dp/dp/0385344767/?tag=saloncom08-20), with SalonTV’s Manny Howard on “Salon Talks.” Bittman suggests thinking of meat as a garnish, snack or accent for you meal, rather than the center of the dish. “The meat that used to serve one, now serves four,” Bittman said. In the book, Bittman assembles recipes in utilitarian troikas that have a soothing effect, giving the reader the reasonable impression that, for tonight’s meal at least, anything is possible. Watch [Bittman’s full episode]( https://www.salon.com/tv/e/713870/c/3948) to hear more about his new approach to meat dishes and what his fans love about his famous grilled cheese recipe.